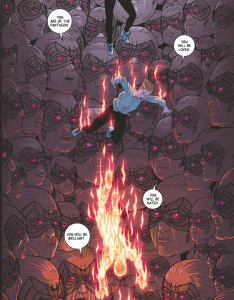 Epistemological YOLO: Kieron Gillen’s The Wicked + The Divine Vol 1-2 – Comic POW! Kieron Gillen has a lot of things going on in The Wicked + The Divine Volumes 1 and 2, but below the plot there are some profound thoughts about godhood, the YOLO ethos, music idols, and resentment. The plot, as the you no doubt already know, is that every 90 years 12 gods are resurrected for two years. For the most part it appears unclear why this cycle was set into motion and how it jives with the stories we have about gods. At one point near the end of the second volume we’re told that the gods have to fight The Darkness and it appears that The Darkness is responsible for human dark ages. We’re told that men would have been on Mars by the Roman times if The Darkness had been held at bay. Of course, it’s possible we’re being subjected to an unreliable narrator. Gillen’s contrivance focuses the comic on teenage impulses. Since at least the birth of the teenager as a demographic in the 1950s (if not earlier), teenagers have taken a YOLO (you only live once) attitude to life. This comes, at least partially, from the fact that teens are not quite as mentally capable as adults as seeing the consequences of their actions (due to part of the brain not yet being fully developed). But it stems almost as much from the fact that, since the 1950s, teens have have more and more free time and have been encouraged not to grow up and enter the workforce yet. An abundance of time and a lack of forward thinking can lead to a lot of “in the moment” decision-making. Gillen pushes this further by having the gods know that they only have two years left in their life. Most of us fantasize that if we were told we only had a limited time left that we would do everything that isn’t prudent when we might need to deal with the consequences into old age. Many with terminal illnesses act on it. But in the case of the gods in WicDiv, they know they have exactly two years of life as gods before they perish. This leads all the gods to follow their most hedonistic pleasures. Gillen also explores another teen idea with the gods being worshipped only in the metaphorical sense – the same as we worship pop stars. To complete the metaphor, many of the gods are pop acts or throw lavish parties. Gillen also mixes the metaphor a bit by having yearly conventions dedicated to the gods in which people attend panels chaired by the gods and seek their autographs. There is another layer to the fact that the gods only possess their godhood for two years. I was raised as a protestant Christian and there was always something slightly strange to me about the ministry of Jesus. Other than the story of Jesus discussing scripture with rabbis, we really don’t hear of anything from his birth to his adulthood. But once he is ready to start, he receives a baptism from John The Baptist before beginning. Yet, after that, even as he is preaching and working miracles, he still seems somewhat not completely God. As a bit of background, the way I grew up, was that Jesus was another manifestation of God However, Jesus asks God if he could not be crucified and accuses God forsaking him on the cross. That hardly makes sense if he’s God. However, if his godhood was something that fell upon him when he was baptized, then this makes more sense. 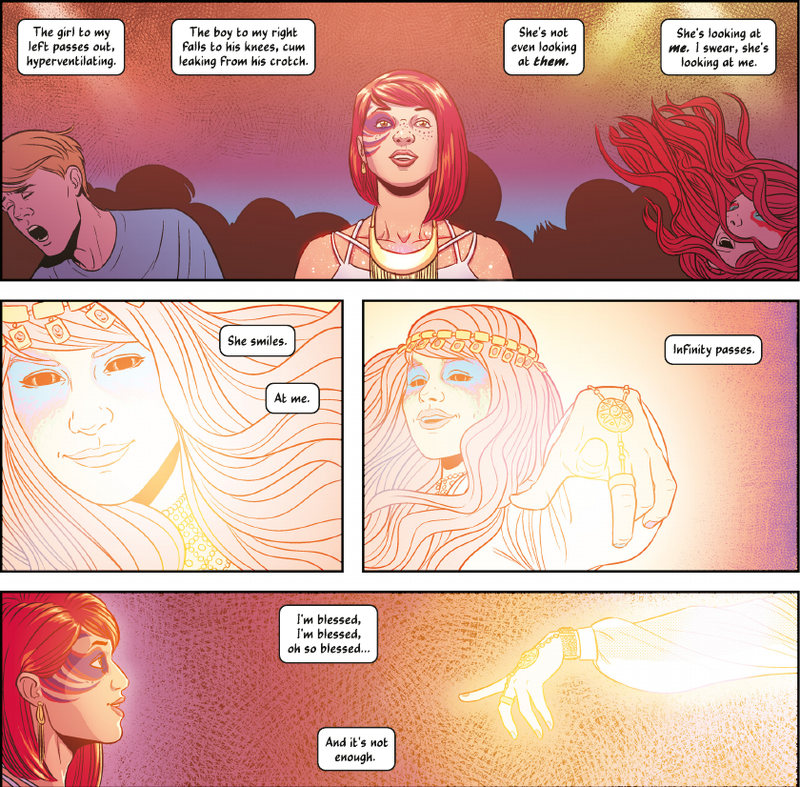 I wonder if this is similar to what Gillen had in mind for the gods in WicDiv because they are all ordinary people until Ananke finds them and wakes up their godhood. The gods are uncertain and have to be guided with their powers and so forth. It’s possible this was part of the commentary Gillen was trying to make. I had assumed that the gods would die and be reincarnated, but would always be the same person, ontologically. Rounding things out is the idea of resentment. Longtime readers know that Comic POW! commentary posts are full of spoilers, but I’m going to put an extra warning here as it fully concerns volume two. 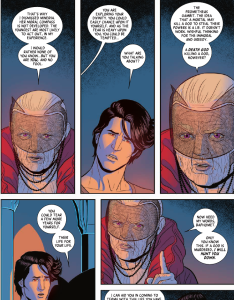 Ananke is the only person in The Pantheon that’s old. We see her as old in the 1920s and again in 2014. At first blush it seems not to matter – she is revealed to be the one who ushers in the new gods and it fits within our prejudices that such a person should be old. She is also seen to function as mentor for and mediator between the gods. It is not until she gives a tell-all speech to documentarian Cassandra (fun name for someone who doesn’t believe the gods are real) about fighting The Darkness and someone staying behind (her), that we really begin to suspect exactly what’s going on. The first hint for the most astute of readers is when she mentions having given up much for the others. My suspicions were aroused when she took Baphomet, who was the most likely to commit violence, and told him that the Prometheus Gambit didn’t work the way the humans thought it did, but that it would extend the life of a god by the amount they took from the now dead god. But I was shocked when she killed Laura right after Laura becomes Persephone. 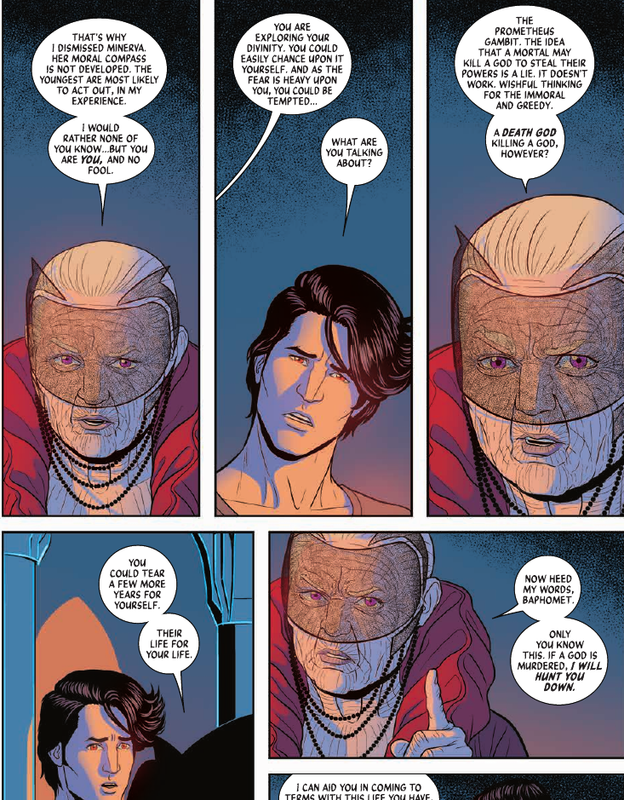 When I awoke the next day I wondered whether Ananke was killing gods in order to remain alive for so long. There was also, of course, the possibility that she had simply gone through too many cycles of rebirth with the gods and had become unstable or simply resentful that she does not get to be reincarnated with a young and beautiful body. That interpretation would certainly fit in with the god as pop idol metaphor. I had a feeling The Wicked + The Divine would end up being full of metaphors and allegories, but I had no idea how layered things were going to get. I was excited because I’d enjoyed Gillen’s run on the X-Men line, but had no idea how much fun I’d find this series. For anyone who enjoy’s Gillen’s storytelling style and also knows a lot about ancient gods (I confess for a few of The Pantheon I didn’t know much about them other than their names – like Baphomet [which I knew from Final Fantasy summons] and The Morrigan [which I knew a little about from Peter David’s run on X-Factor]), there might even be extra layers of enjoyment from this series. The Wicked + The Divine written by Keiron Gillen with art by Jamie McKelvie and Matthew Wilson. Letters by Clayton Cowles. Pingback: Image Comics Creators Own Worlds Humble Bundle Live Today! | Comic POW! Trackback: Image Comics Creators Own Worlds Humble Bundle Live Today! | Comic POW!